Shopping in between season means you get winter bargains like Tokidoki hoodies for $30-40US. Winner! The vinyl obsession continues a couple doors down with Munky King. This store is set up more like an art gallery than a retail store. Minimal lush fittings and an art space towards the rear of the store. They stock a big range of the usual Kidrobot and associate style vinyls as well as a few other more obscure designs and artists. There’s also a small selection of apparel. Definitely the place to visit if you’re getting sick of Dunnys or Labbits. On the subject of vinyls and similar toys/action figures, be ready to pull them out of your carry on at American customs, especially those with small parts like Revoltech figures. Thanks to the unusual shapes and small parts, under the x-ray machine they tend to come up as “unknown”. 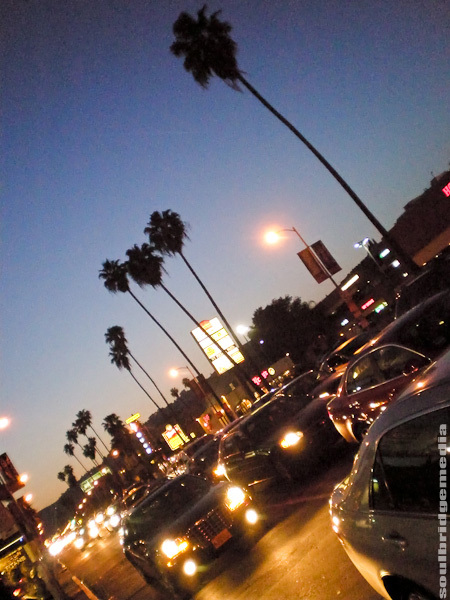 The shops start to thin off after this, but hook a left into La Brea for a couple of LA’s colourful landmarks. First is Pink’s Hot Dogs, no, not the singer but just as famous with many celebrities choosing to pop in for a quick bite and also being featured in many movies and TV shows. 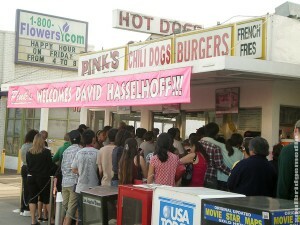 We weren’t disappointed when we walked passed and saw a banner “Pink’s welcomes David Hassellhoff“. Sure enough, The Hoff was there slingin dogs to a line half way down the block. Though a long line up is hardly out of the norm and is classed as part of its charm. We didn’t have time to sample the cuisine but all reports say its worth the wait. If you didn’t want to wait for food there’s a few fast food places including Macca’s as you head north on La Brea. Couple blocks on, you’ll also come across a Best Buy (like a cross between Office Works and Harvey Norman) and a group of shops including Target. 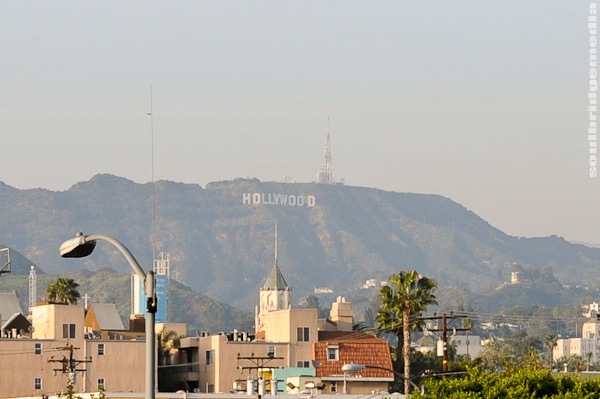 In this centre, if you walk up the stairs to Target, there’s a landing where you have a clear view of the Hollywood sign. Perfect if you aren’t going up in the hills to check it out. 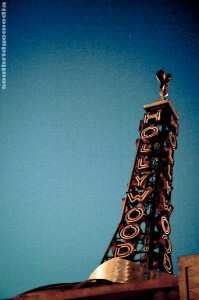 Photographer’s tip: for a nice big shot of the sign – point and shoot users – you’ll need at least a 10x zoom; dslr users – 200mm is ok but 300mm if you want to fill the frame. Another photo op is available on Sunset Blvd at the intersection looking west at sunset (they don’t call it that for nothing!) against a backdrop of the clichéd palm tree lined street. 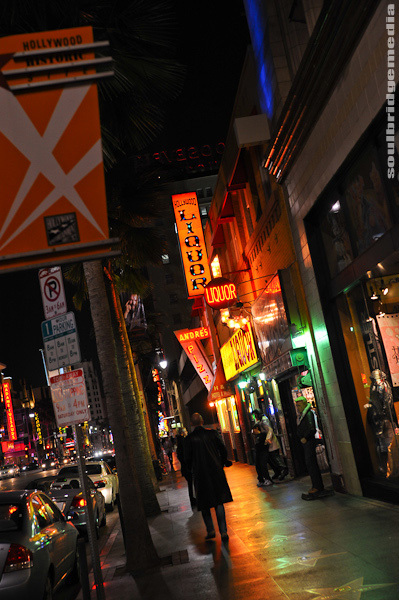 A block and a bit further you’ll come across everyone’s favourite tattooist, Kate Von D and her famous LA Ink store aka High Voltage Tattoo. If you’re familiar with the TV series, the store is just as crazy in real life with wall to wall decorations of memorabilia, varies knick knacks and art pieces. Even if you only have a passing interest in the pierced and painted, simply hanging round the store sees all matter of subjects from the quirky to the down right weird! Good luck getting an appointment on short notice tho! 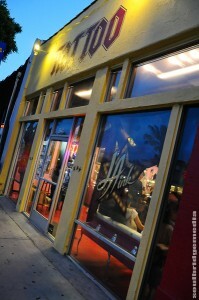 If you’re Google mapping, search for “High Voltage Tattoo” which is the actual store, “LA Ink” shows up as its studio which is further down the block. 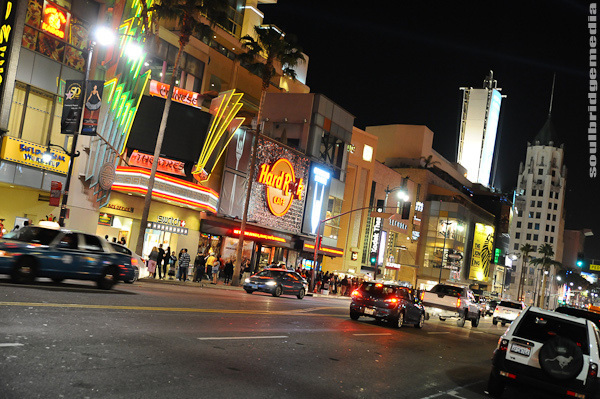 About 4 blocks after that and passing Jim Henderson’s Muppet Studio, you’ll hit Hollywood Blvd, which is the start of the Hollywood Walk of Fame and home to iconic landmarks such as Grauman’s Chinese Theatre, Madame Tussauds, Ripley’s Believe it or not and Capitol Records Tower. There are also plenty of tacky tourist shops on this strip, but the pricing for the most part is reasonable and you can pick up multiple souvenir tee’s for $10US. Just check their quality first, even though the design might be the same, the consistency of the shirts tend to vary. On the cheap: find a bus that goes all the way down N La Brea to W 3rd St then get another that goes from there out to La Cienega Blvd. The Beverly Center is probably the closest you’ll find to Brisbane’s own Myer center. Couple large higher end Department stores like Bloomingdale’s and Macy’s and then the countless specialty shops with the majority leaning towards female shoes and apparel. There is a cinema and food court on the top level but the real reason to head here is for the view. There’s an outdoor courtyard on the top level with a nice broad 180 degree view of LA. Photographers tip: bring a tripod to set on a chair to shoot over the glass partition or a point and shoot to sit on top of one of the frame if you’re shooting at night to get pass the reflections, unless of course you carry a black bed sheet around! In the way of sneakers you have a choice of 2 sporting stores Champs and Finish Line and 1 specialist (on the top floor level 8 ) Shiekh Shoes and Footlocker (floor 6). While only Shiekh Shoes has a selection of slightly more obscured models and colourways the real benefit is they all have a good selection of items on sale at great prices. 2 pairs of Adidas Attitudes for $50US? Don’t mind if I do! The Footlocker here is quite large as well so there’s a chance you’ll find a few extra colourways. Useless fact: In the movie “Volcano” they have scenes when the center was still under construction. By now, you’ll probably be as broke and broken as we were. We contemplated paying $50 for a cab back to Santa Monica but with a bus stop on the corner, we caught one up La Cienega Blvd to Santa Monica Blvd, got some booze and aspirin from the CVS drug store and then another bus all the way back out to 4th street in Santa Monica for a fraction of the cost. Back in Santa Monica we hit the hay so we could hit boardwalk the next day. Next up… Santa Monica and Venice Beach!